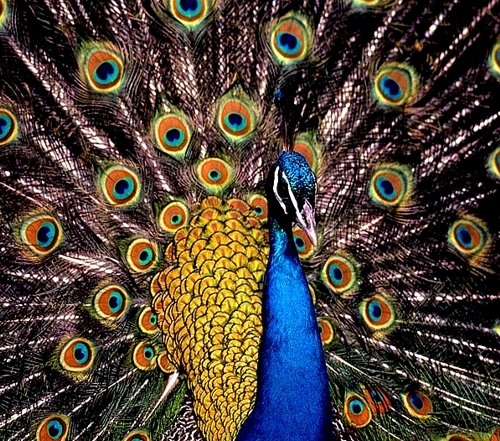 The peacock is a very large bird, and colorful, typically bright greens and blues. Peacocks are a type of pheasant, that is known for the iridescent tail feathers that they can spread out in a train that flows behind them, or spread upward, to form a fan of color. The peacocks tail is usually about sixty percent of the total length of the bird and has markings on it that shine gold, blue, red and green and have the shape of an eye inside them. They use the train for mating and courtship displays, arching it into the most incredibly beautiful fan that will reach completely across the back of the bird and still touch the ground on both sides. The females, scientists believe, choose the mate according to the large size and the brilliant colors of the feathers, as well as the quality of the male bird. Peacock, the word is used interchangeably to refer to both male and female however, females are technically called peahens while the animals themselves are peafowl, rather than the term peacock that is used most commonly to describe them all. Males who have the largest and most colorful display will gather a harem to them, consisting of several females each of whom will lay three to five eggs, nesting on the ground,. In the wild, peafowl will usually roost in trees at night and gather in groups, which are known as peafowl parties. The peacock is a ground feeder, and eats insects, vegetation and small mammals and lizards. There are two types of peafowl that are familiar to people. The blue peacock inhabits India and Sri Lanka while the smaller, green peafowl are native to Java and Burma. Another, much smaller species which is far more distinct and much less known species, is the Congo peacock, which inhabits the African rain forests. Peafowl have been used as pets for many years, and were traditionally kept by royalty in gardens and zoos, which practiced selective breeding techniques to create some strange and abnormal color combinations. 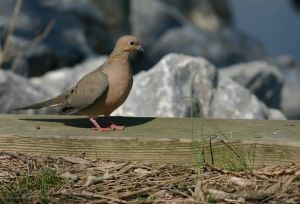 The wild birds themselves can have varying colors according to their range. In the wild the peacock will live to be about twenty years old, and may grow to be fifty inches long including its train. Peacocks are not good pets in that they are abrasive and can be testy with other pets as well as humans. At one point they were kept strictly for their feathers which were used in adornments. It’s really the best i think i have seen ever, thats if it’s natural and not edited by photo shop. What kind of food that this bird eating ? Wow! Thats amazing! It must be hard to deal with sometimes though, i mean living with a loud Peacock. I love Peacocks there amazing and beautyful! I also love all the fun jewelry thats being desighned after them too! Like earings, and bracelets, and head bands, and stuff, though i hope the makers arent plucking real Peacocks for there colerful bountie!!!! Also does anyone know how Peacocks got their name???? Super curios ’bout that. 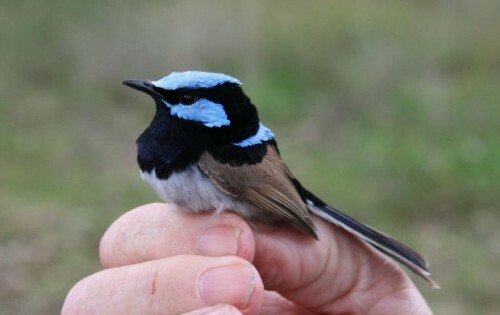 This beautiful bird now needs protection in its home range. Chemically treated seeds are killing a number of peacocks every year. I have read that the color of peacock’s train is of brown pigment not of blue and green What makes it colorful is the bending of light -repeating microstructures of the feather that reflect a certain wavelengths in perfect sync, intensifying a given hue. Really that’s quite a feat, truly marvelous. Isn’t it? 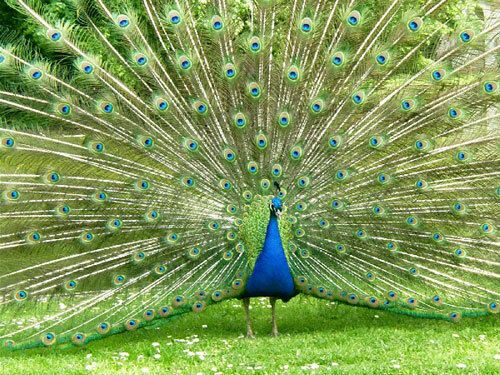 peacocks are the most beautiful birds in the world. peacocks can come in blue green pink white and more. hello, i live in a town outside Amsterdam, and i have peacocks come in to the garden, they come from the park across the road. so for over a year now i first had 3 girls then the man came by to have a peak. haha and now just 2 days ago i had the mama and 5 babies. its was sooooooooooo sweet to see this. i have never seen babies before. It’s funny all the contradicting info you get on the Internet. I was just on the National Geographic site about peacocks and it said that they were not aggressive to humans or other pets like dogs you have in your home. That they were very good pets and good with humans. I went to yet a few more sites and they all said the same as the NG site. Your site is the first site that was negative about them making good pets and being aggressive with humans and other house pets. Go figure.